It’s a shameful secret I carry with me wherever I go — I haven’t been to Maui in years. I try to console myself with the fact that I moved back to the mainland for a few years, but, really, there’s no excuse. This magical island is right around the corner, and it’s home to nearly all of my favorite things: Luxury hotels, fantastic marine life, and exquisite scenery. So, in October, our family plans to meet Tutu and Auntie Natalie over on The Valley Isle. And, you can guess where we’ll make our first stop: The Maui Ocean Center. The venue is hardly just for kids (my husband and I went pre-kids), but it IS a really great place for a family outing. What’s more? 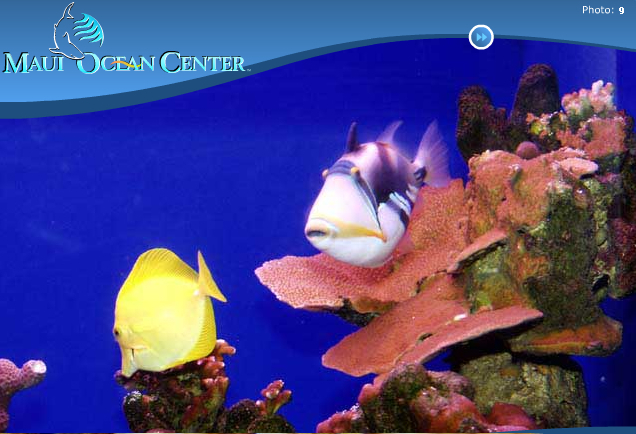 The Maui Ocean Center has a few new attractions that are cultural, educational, and fun! When you book your Maui Ocean Center tickets through Hawaii Aloha Travel, you may even be eligible for a significant discount. According to the Honolulu Star Advertiser, each day at the Maui Ocean Center, Hawaiian practitioners share their knowledge and skills during this cultural program. Dane Maxwell, Maui Ocean Center’s Hawaiian cultural adviser, teaches guests a hula and “talks story” about Hawaiians’ connection with the sea during an hourlong session beginning at 11:45 a.m. Tuesdays. And, the paper says you can enjoy other activities scheduled between 10 a.m. and 2 p.m. on a rotating basis. For example, Sam Paleiku and his son, Hoyt, might be carving fishhooks, humpback whales and honu (sea turtles) from local woods such as ohia, koa and monkeypod. On view might be Kekai and Colleen Kapu’s exhibit of Hawaiian tools, weapons, hula implements, musical instruments and shell and lau hala jewelry. Also participating regularly are fishnet weaver Greg Gomes and Joel Heinz Sr., who creates Hawaiian-themed art on tapa. Do you have kids who are obsessed with marine life (and they’re night owls, too?) Check out the Maui Ocean Center’s Night at the Aquarium. The Honolulu Star Advertiser has the details: From 6 to 9 p.m. every Saturday in July and August, visitors can get acquainted with its nocturnal marine animals, including moray eels and spiny and slipper lobsters. The event also features a Turtle-rrific Station where aquarists discuss turtle biology, behavior and diet and bring out a few turtles for up-close viewing. In another area, attendees are able to touch urchins, sea stars, sea cucumbers and other tide pool critters. There’s also a dive presentation and live entertainment, and the Seascape Maalaea Restaurant is open for dinner from 5 to 8 p.m. Admission is $49 for adults and $39 for children 3 through 12 (book online and get a 10 percent discount), $34 for kamaaina and U.S. military personnel with a valid ID ($24 for kids) and $19 for Maui Ocean Center members. Prices include two drinks; pupu and additional drinks are available for purchase. The Night at the Reef: Incredible Corals occurs during the summer months, typically a few days after the new moon, and this year the Maui Ocean Center thinks it will happen on July 17th. Like to see out into the wilderness, but don’t like spending money? The newspaper says there’s a covered observation platform reveals a panorama encompassing Haleakala Volcano; Maalaea Bay and Harbor; and Kahoolawe, Molokini islet and the resort areas of Kihei, Wailea and Makena in South Maui. It’s equipped with two telescopes that visitors can use free of charge. The Honolulu Star Advertiser reports there’s another free “event” that’s available daily. The Sheraton Maui Resort and Spa in Kaanapali provides a beautiful seaside setting for Maui Ocean Center’s educational kiosk, which is open from 9 a.m. to noon daily. A marine naturalist is on hand to introduce visitors to the intriguing creatures that live in the ocean a short walk away. Takeaway brochures and fliers offer tips on ocean conservation, including sustainable seafood choices. There are also ocean-related puzzles; books on sea turtles, marine invertebrates and reef fish; and microscopes to examine samples of seaweed, shells, crabs, brine shrimp and other specimens. With diversions of interest to all age groups, this is a great stop on the way to or from the beach. 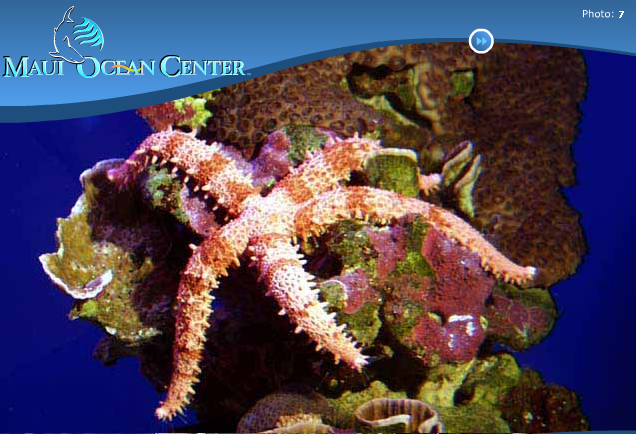 For those of you who love to get up-close to Hawaii's marine life, a trip to the Maui Ocean Center is a must! If you time your visit just right, you may just catch the Maui Ocean Center’s “Night at the Reef: Incredible Corals,” an annual event on the night scientists anticipate rice coral around Maui (and at Maui Ocean Center’s indoor and outdoor exhibits) will spawn. This occurs during the summer months, typically a few days after the new moon, and this year the Maui Ocean Center thinks it will happen on July 17th. Other coral species also spawn during this time, but rice coral has most consistently met predictions. Coral expert Dave Gulko, a marine biologist with the state’s Division of Aquatic Resources, will be the keynote speaker. Biologist Pauline Fiene of Mike Severns Diving, a Maui-based scuba diving tour company, will also be there, mingling and chatting with guests. Watch videos of previous coral spawnings; see the dive presentation; and linger at stations to learn about the live coral displays, coral reproduction and what can be done to reduce negative impacts on reefs. Doors open at 7 p.m. Admission is $30 for adults and $25 for children 3 through 12, including coffee, juice and iced tea (heavy pupu, snacks and desserts will be available for purchase). Kamaaina, Maui Ocean Center members and U.S. military personnel will receive a 20 percent discount. Reservations are recommended; this can be done online or by calling 270-7075. General admission: $27.95 per person, $19.95 for children 3-12 and $24.95 for seniors 65 and older. Kamaaina, kamaaina children and military personnel with valid ID pay $16.95, $9.95 and $14.95, respectively. Theres an additional charge for the behind-the-scenes tour and Shark Dive Maui, which allows certified scuba divers to enter the 750,000-gallon Open Ocean exhibit for close encounters with its 1,200 inhabitants, including six species of sharks. Notes: Daily shuttle service is available between MOC and select South and West Maui locations with the purchase of a pass, package or general admission ticket. The fare costs $5 per person, but during July and August its free. Reservations are required. Go to the website or call 874-6060. October can’t get here soon enough! I’m so excited about going back to one of my favorite islands AND showing my kids one of my favorite places, the Maui Ocean Center!